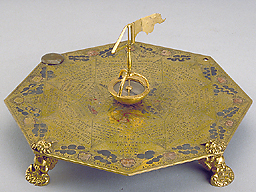 This instrument consists of a gilt brass plate, with a compass in a cup-shaped box in the centre. The compass is surmounted by a tripod where a small metal piece, the wind vane itself, is fixed. Around the compass are engraved representations of the four elements and temperaments, and also the names of the sixteen main winds and the weather associated with them.